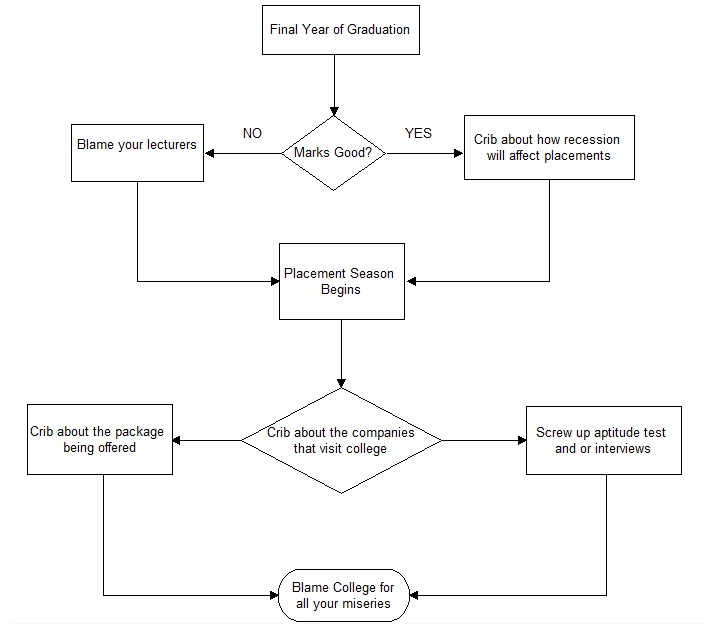 Prevalent in all major colleges in India, the above diagram illustrates the general behaviour of a student in his/her final year during placement season i.e their first career recruitment. Unrealistic expectations, mood swings, tendency to blame unrelated factors, competing with friends – all come into picture. Note: The Pundits are not immune to this phenomenon. It feels like the end of an era, the last of the good old days and the final frontier with life staring from the other side when one graduates from college and into the world beyond the walls of the campus. Facing the realities of life as one leaves college may seem like a daunting prospect and one often feels inept and ill equipped for it. Starting a business, joining the work force, taking the family business forward or even studying further, all require an amount of pre planning and analysis of one’s skills to be able to choose the best among the myriad possibilities. A lot depends on where you see yourself in, say, ten years’ time. Do you see yourself at a desk in an office, or in a rainforest looking to capture the perfect picture? It’s a matter of perspective as a job which is appealing to one person may be the last thing another person would do. It all boils down to competition in the end, a real life “survival of the fittest” scenario where the best are chosen to occupy the higher ends of the social ladder while the mediocre are shown the door. An entrepreneur will only be successful if he either has a novel idea of a unique start up or he works on an existing idea while making it more efficient and better suited to needs. Similarly, a quality firm will hire you only when you have proven to be better in aptitude, skills, and personality, than your immediate competitors. A family business will stagnate if you do not possess the skills to effectively take it forward while maintaining its legacy. And if you’re looking for an admission into that dream university of yours, it would require clearing entrance exams and various other tests to separate you from the ones who will be rejected. Alas, we all fear rejection! What we forget is that rejection is a kind of a litmus test which tells us what we’ve been missing all along. It often shatters self-confidence but brings us back down to earth so that we evaluate ourselves and then give it another go with all our concerted efforts. If we find that it still hasn’t quite worked out for us, then it’s probably because we have been directing our skills and efforts in the wrong place and a realization that our real competencies lie elsewhere dawns on us. It’s not unheard of to take time off to re-evaluate ones interests in life before “going with the flow” – something that a majority of us do end up doing. Unfortunately, our society doesn’t allow that kind of breathing space for a young person who is still learning about his inclinations in life. Society inherently demands you to follow the existing trend and often frowns upon anyone who breaks from the rut to pursue their own ambitions. Yet it is how great people are created; people who question trends and have the confidence and aptitude to shape public opinion and social values while leading from the front.